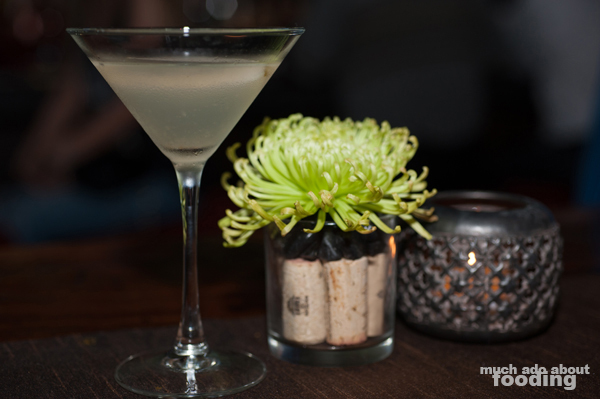 Find Your Groove at AnQi's "Fashionably Early Wednesdays"
If weekend nights are the only times you go out for a good time, you might be missing out, especially when AnQi over at South Coast Plaza has unleashed Fashionably Early Wednesdays. 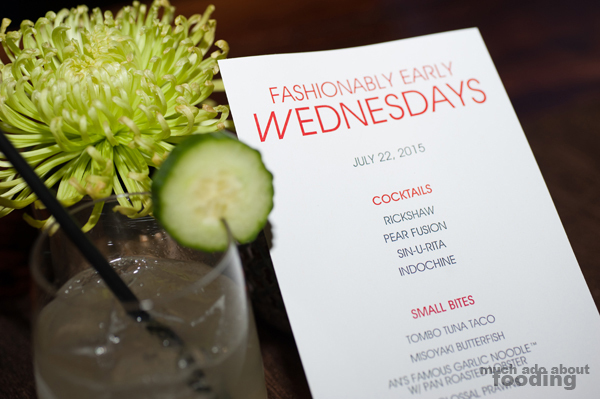 These weekly bashes are partner to their Fashionably Late Fridays which celebrate good drinks, food, and company. The restaurant itself is laid out with several areas that mimic a lounge feeling so it seems only natural to incorporate other elements throughout the week. During this mid-week nights, experience not only their cocktails and bites but also the pulses from a live DJ spinning downtempo lounge music. We were invited to preview some of AnQi's offerings during these evenings, and it seems like a desirable place to bring a group together to. 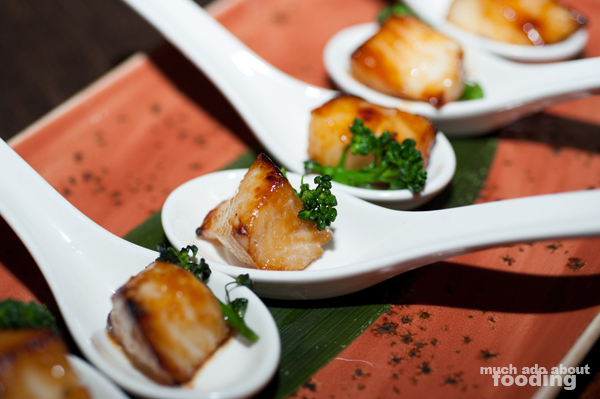 From 6pm until closing, guests are able to partake in a variety of AnQi's typical offerings in an lounge atmosphere. We began our night with the Pear Fusion cocktail (Grey Goose pear, St. Germain, muddled Asian pear, and fresh lemonade), a deceptive drink that was much more pear than alcohol. Easy to drink and strong in pear flavor, this can be your cocktail of choice if you are keen on that fruit. 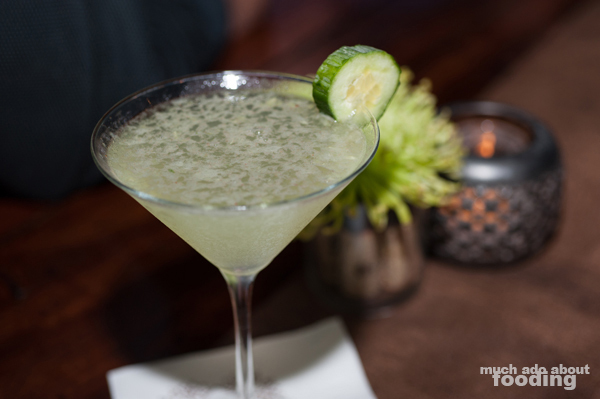 If you prefer a more refreshing, light drink, their Indochine (Plymouth Gin, St. Germain, Tyku liqueur, and hand-pressed cucumber and lime) is very much that with its distinct cucumber taste and herbaceous botanical nose from the gin. Crushed ice also contributes to the overall inciting of cool and thirst-quenching feelings. 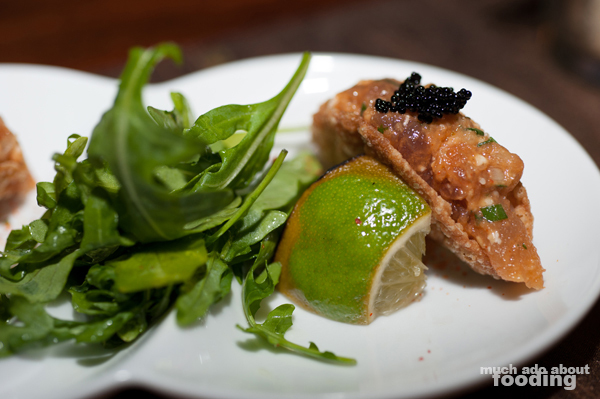 The first addictive bite out was their Tombo Tuna Crispy Wonton Taco (yuzu-kosho, Hass avocado, macadamia nut, white truffle, and black tobiko caviar), a finger food that could be devoured in a one mouthful. The varying flavors from citrusy yuzu to buttery avocado to savory macadamia played well together but at certain points, the truffle oil was distracting. Such a poignant scent, it was used just a touch here but even so, could overwhelm the other flavors in some batches. Those that weren't overtaken were a pleasant blend of tastes and textures, especially with the crunchy shell and popping roe. The drinks kept pouring as I am sure many guests would enjoy. 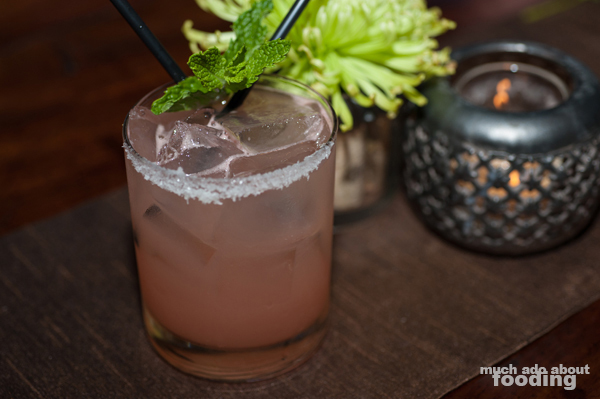 Their Sin-U-Rita (Herradura Blanco tequila, hand-pressed watermelon, jalapeño, and rock candy) had both a clever name and clever mix. Tequila's typical bite was made unnoticeable with watermelon's sweetness but both were surprised by the spicy kick of the pepper. Rock candy allowed the drink to be less cloyingly sweet and more as if brushed by sugar. 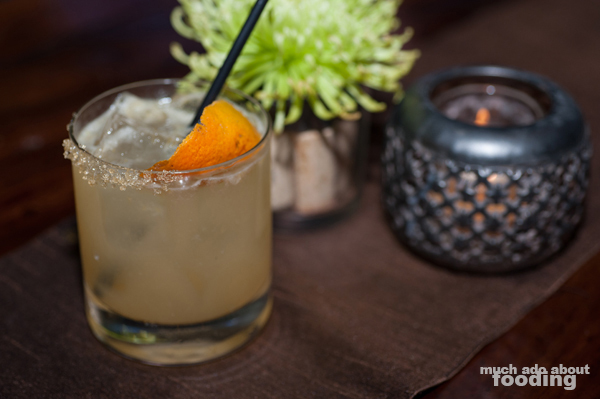 We enjoyed the Rickshaw (Makers Mark, Cointreau, lemon, lime, orange, and granulated brown sugar rim) to a degree but it was apparent that the spirits used combined with a brown sugar rim made it too sweet for my own tastebuds. 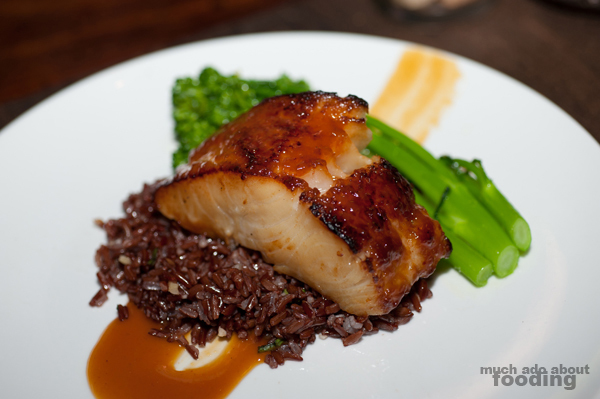 Luckily, to save the occasion was AnQi's Misoyaki Butterfish served that evening as bites on ceramic tasting spoons but normally, the dish comes with aromatic red cargo rice, Thai herbs, and broccolini. The fish is bathed in a dijon-misoyaki glaze which gives it a slightly sweet but richly savory coat. Such tenderness in the flesh was impressive, and we admired how clean and fresh the butterfish was. There was also an abundance of natural juices as we pulled away each flake, enhanced by the glaze itself. 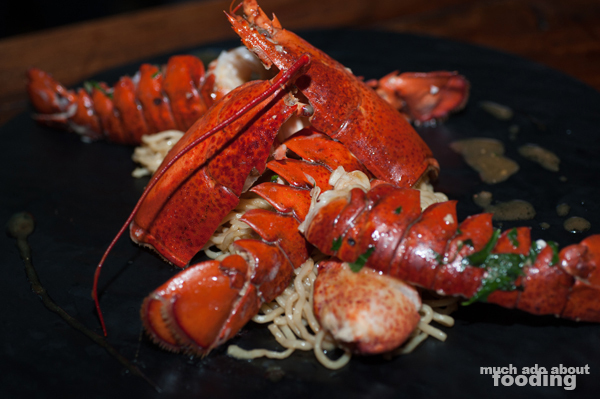 The true star of it all, however, was An's Famous Garlic Noodles paired with chargrilled lobster from the Secret Kitchen. Who has gone to AnQi and not gotten these noodles? Garlicky and bursting with flavor, these noodles made me frantic to have more, and the addition of fat chunks of lobster only fueled that desire. There is no guess as to why these are "famous" and beloved by AnQi guests; they are fantastically executed and hit the natural cravings we have for such savoriness. 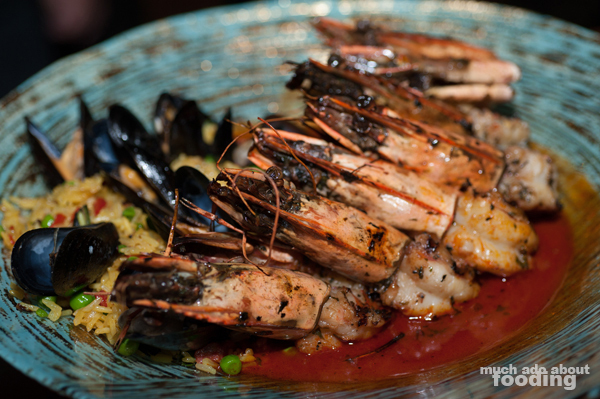 Lastly, we then dug into AnQi Chargrilled Colossal Prawns which were accompanied by tumeric fried rice, Bilboa chorizo, Manilla clams, piquillo pepper fume, and quinzoi liaison. With so many additional ingredients, the dish was an ostentatious display of what could provide an adequate backdrop to such enormous prawns. The sizable creatures were hearty and cooked well, though after a few, they started to get salty. However, the other ingredients helped mitigate that with their aromatic, spice-heavy profiles. Overall, the evening was a good indicator of what Fashionably Early Wednesdays are meant to become. If you would like to participate and join the AnQi group from 6pm to close on an upcoming Wednesday, find them at 3333 S. Bristol St., Costa Mesa, CA 92626. Giveaway - OC Fair 2015 "One Big Party" Tickets!